The possibility of a second device under scrutiny will make it harder for Volkswagen to emerge from the crisis. WASHINGTON (Bloomberg) -- The EPA is investigating a second emissions-control software program in Volkswagen cars that were rigged to pass pollution tests, one that the automaker may have failed to properly disclose. The computer program is on the EA 189 diesel engines used since 2009 that are also fitted with software that the automaker has admitted was designed to fool emissions tests, according to a person familiar with the matter who asked not to be named because the information is private. The possibility of a second device under scrutiny will make it harder for Volkswagen to emerge from the crisis. Already, VW faces criminal and civil liability as a company, including more than 250 class-action lawsuits. Some of its executives also may face individual charges, and investigators and prosecutors are trying to figure out just how widespread the cheating was. The device was disclosed in applications to regulators for the 2.0 liter turbo diesel engine models to be sold next year, the company said Saturday in an e-mailed statement from Wolfsburg, Germany. The EPA and the California Air Resources Board are reviewing the device, which VW said serves to warm up the engine, and additional information is being submitted, according to the statement. Automakers are required to point out if engines have special operating modes that can affect the way pollution-control equipment works. Such programs aren’t necessarily prohibited, and don’t by themselves indicate an attempt to cheat, though carmakers are supposed to disclose them so regulators can adjust their tests to be sure the vehicles still meet standards. 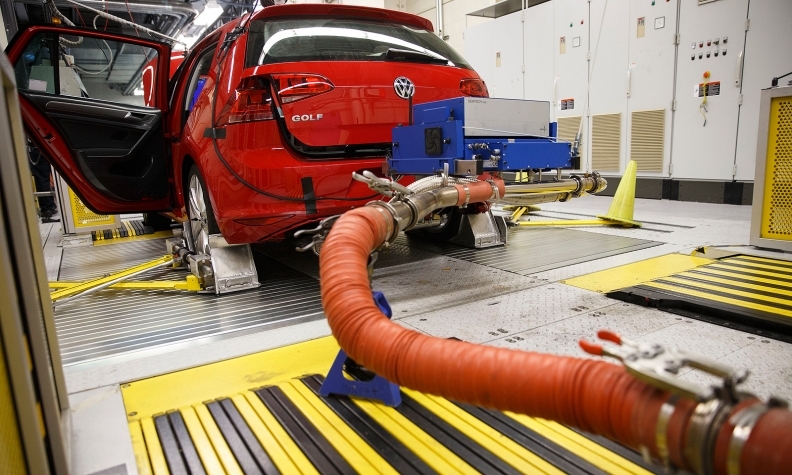 Volkswagen has withdrawn applications for EPA certification of diesel vehicles for the 2016 model year. The company decided the newly disclosed technology qualified as an emissions-control device that the EPA needed to review, Michael Horn, CEO of Volkswagen of America, told Congress Thursday. The probing of the second software feature in vehicles to be sold on 2016 models raised the possibility of VW’s latest diesel engines being affected. As many as 11 million diesel-powered autos worldwide have software designed to fool U.S. pollution testers. That includes 8 million cars in the European Union and 482,000 in the U.S., where regulators first detected the cheating. Volkswagen is delaying or canceling non-essential projects to limit spending after determining that the 6.5 billion euros ($7.4 billion) set aside to address the scandal won’t be enough. CARB spokesman Stanley Young declined to comment beyond saying the agency is engaged in the certification process. Questions about the second software feature were previously reported by the New York Times.